When I am digging through a pile of linens in a thrift shop or antique store, it's often the color of a piece that attracts me first. Do you find that there are particular colors that you are drawn to immediately? 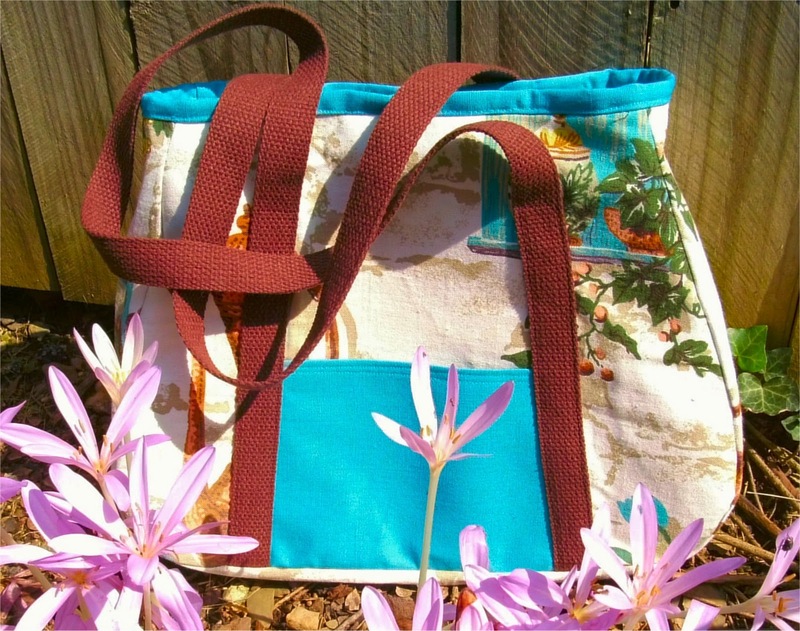 Can you date a vintage textile by its colors? We certainly associate certain colors with the eras in which they were popular. In fact, there are those whose profession it is to predict and shape the colors that will be popular in the consumer world. That's why "avocado" will always remind us of the 1970s, and why you will NEVER be able to match that three year old sweater you bought at the GAP by looking at this year's fashions. The subtle shades of color affect us almost subliminally, but affect us they do! I got to thinking about vintage colors this week. 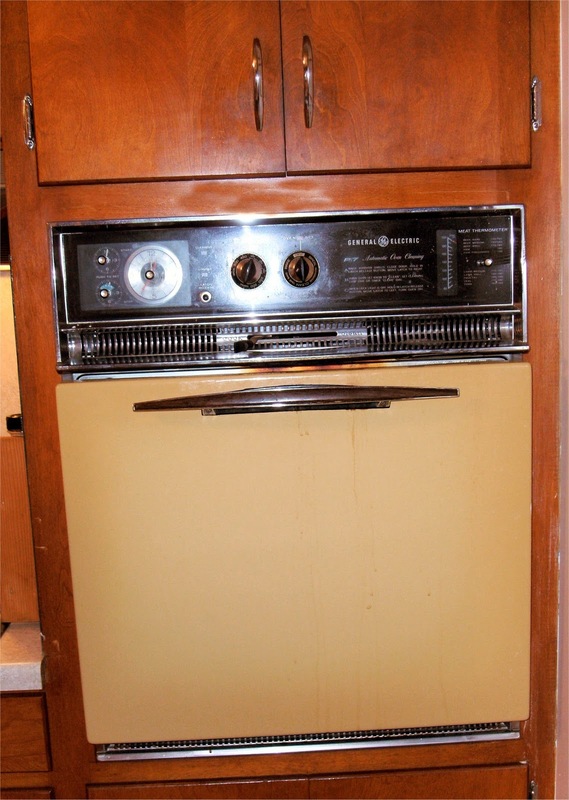 First, right in the middle of baking a pan of chocolate pecan brownies, David discovered that our circa-1967 Harvest Gold wall oven had finally gone to appliance heaven after 44 years. When I bought my 1961 split level house about 12 years ago, it was a veritable treasurer trove of bad 1960s and 1970s decorator kitsch. Shag carpeting, flocked wallpaper, astroturf on the back patio, gold-flecked mirror tiles and faux barnboard paneling... 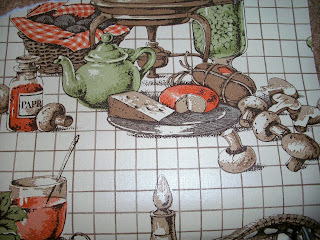 But the absolute apex of the horror was the Harvest Gold kitchen. 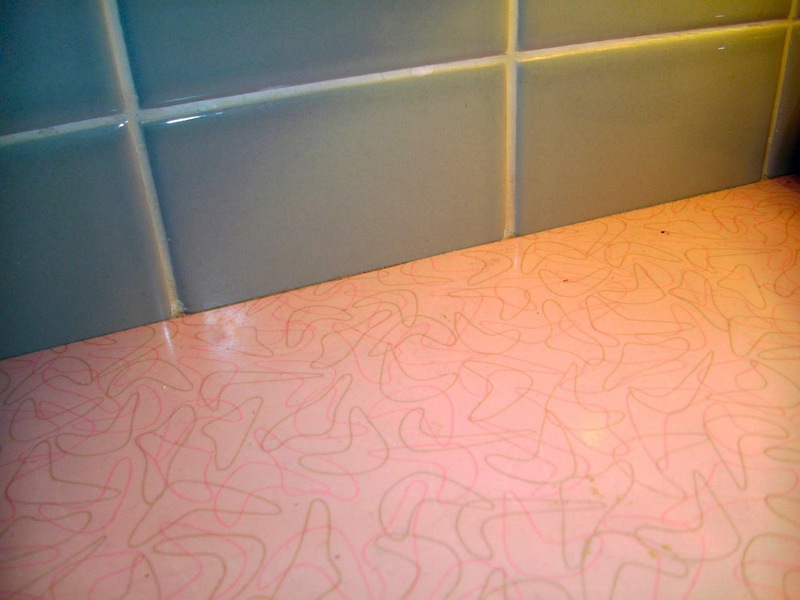 There were gold Formica countertops. Harvest Gold appliances. Brown, gold and avocado carpeting. 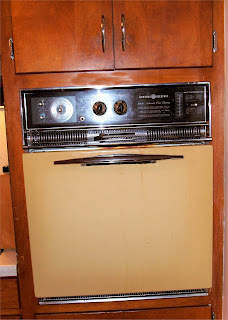 Over the years, I have taken down the wallpaper, replaced the Harvest Gold dishwasher, replaced the countertops, and now... the last vestige of Harvest Gold--the wall oven--is waiting to be picked up by a local Freecycler who wants to give it a good home! Hooray. 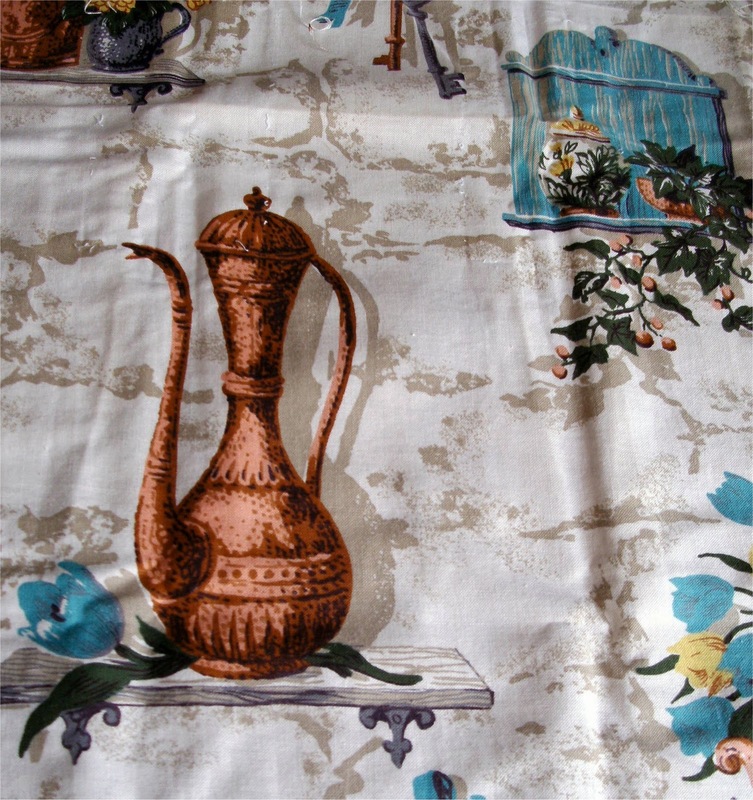 So while I am not a huge fan of these vintage colors as part of my home decorating scheme, I am drawn to vintage colors in fabrics. 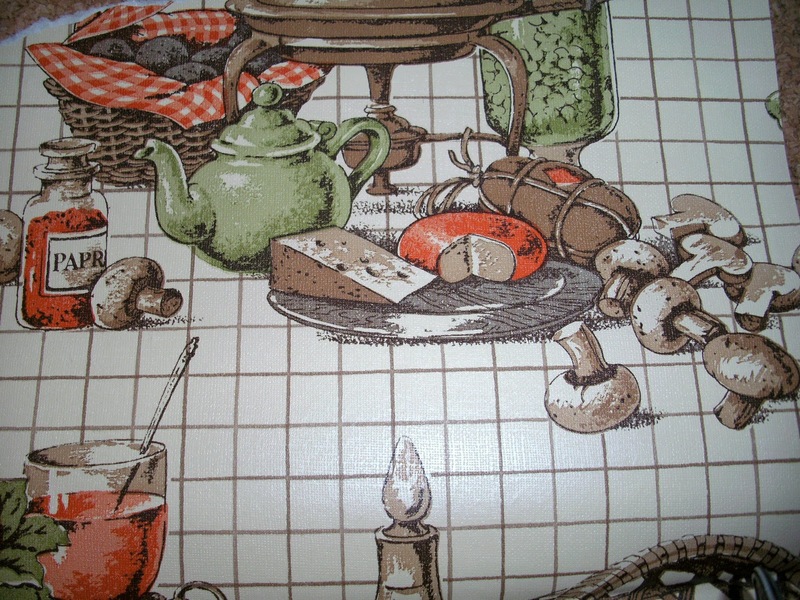 For example, I picked up these amazing mid-century kitchen curtains recently. 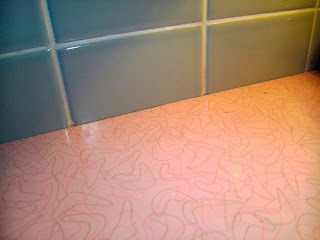 Aqua was trendy for kitchens in the early 1950s. I combined the fabric with an aqua linen hand towel and made this tote. and a pile (16 of them!) of vintage pillow cases with great printed borders that I got for $5 at a thrift store. And yes... $5 for the pile! 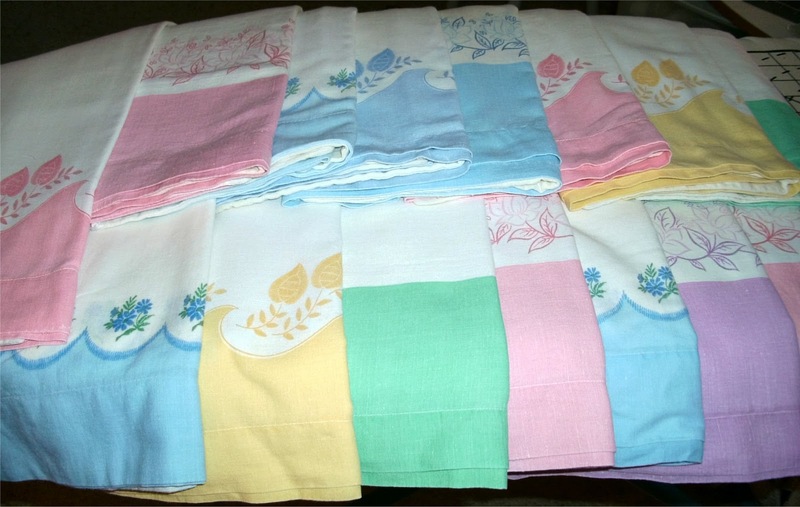 The white portion of many of them is yellowed beyond use, but the borders are in fantastic shape, and will be perfect for trim or accents, and will coordinate with some of my vintage tablecloths. 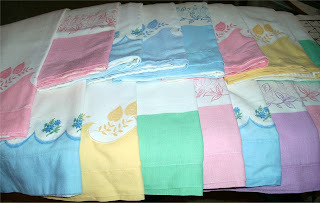 Are there vintage linens in your closet with colors that evoke memories from the past? Why not let me transform them into something that you can use again!